I do have a review of No Man’s Sky coming. Eventually. It’s a game I want to take the time to properly digest before reviewing, but from the time I have spent with it so far, what is blatantly obvious is that this is a powerful, emotive, important game. What I did want to highlight is just how much of an impact the first couple of hours have had on me. 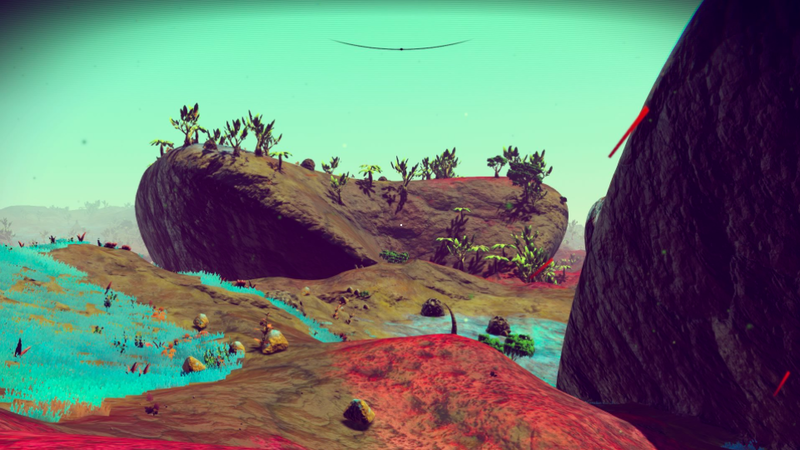 As everyone knows, No Man’s Sky is a procedurally-generated game and that means that just about everything you experience is randomly generated. I started out on a frigid planet, with the temperature hovering around the -10 degrees Celsius mark. But it was a planet teeming with life, with forests of plants and a wide range of denizens that would scuttle out of the way whenever I got near. My aircraft had crashed and was severely damaged, so the first point of call was to get that repaired up. I scoured the landscape, using my trusty mining gun to extract carbon from plants, iron and plutonium from rocks, and then using those materials to cobble together repairs for my ship. I made the mistake of attacking some drones at one point. They fought back. I died once, and needed to head back to that point after I revived to recover my lost resources. After repairing the ship, I had every intention on exploring the planet further, knowing that once I left I was really unlikely to return. I also still didn’t really know what to do on my journey. The UI hadn’t given me much more of a checklist than things I needed to repair the ship, and I was there, alone and isolated on a planet with not much else to do but explore. But then in the distance I saw an aircraft taking off into space. This surprised me, because there were no other signs that this place was inhabited. I assumed that it was an AI-controlled craft, because while I had heard that this game is online, there are surely too many planets and I’ll never run into another human player while playing. Nevertheless the potential to interact with something that was more involved than a simple beast intrigued me, so I jumped in my ship and headed into space. I didn’t see that craft again, but in the distance there was a space station, so I decided to beeline towards that. There was an asteroid field between myself and that space station, so I shot my way through that (collecting resources along the way), and then sped through space at full speed to the station. One of the things that’s immediately clear about No Man’s Sky is that there is a real sense of scale to everything. Back on my starting planet a scan of the environment showed a point of interest that was “six minutes” away. Yes, distances in this game seem to be measured in terms of the time it takes for you to reach them. “Six minutes” really does mean six minutes, too – I was trudging across the chilly landscape for more than six minutes (with a couple of brief digressions for resource collection) to get to this point of interest. This space station, meanwhile, in orbit one planet next door, was an eight hour flight at normal speed. Thankfully there are warp speeds, but even then it was a many minute journey. I pulled out of the warp too late and ran straight into the space station, but thankfully nothing was damaged. Before ducking into the space station to see who, or what, was in there, I surveyed around my new pocket corner of the universe. The planet that the station was orbiting hung overhead, massive and quiet. In the very far distance there was a flash of light that could have been another aircraft, I guess. But mostly it was quiet, lonely, dark. Space is beautiful, but alien, inhospitable, and of a scale almost beyond comprehension. I knew that every dot of light out there had planets circling it. That one planet that I explored (a little), and that one space station that I was now hovering around, was literally a negligible part of the whole. And I didn’t really know if I was going to find planets of a quality like the one I just left. For all I knew, every place I would visit from here on out, until my resources ran out, would be barren landscapes torn by acid rain, or completely hostile. It was actually then that I felt a touch of agoraphobia, followed by something of an existential crisis. 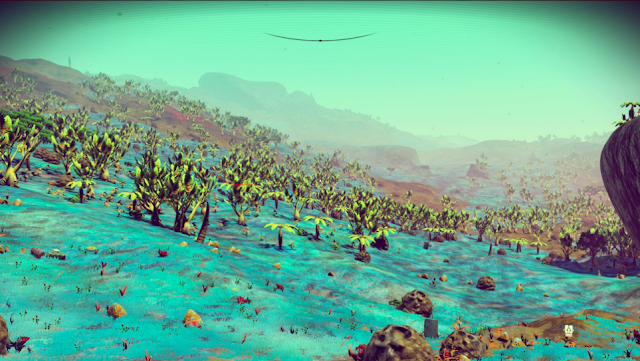 I’m of an age when I’m about ready to go through a midlife crisis and sell DDNet to buy a super fast sports car already, but of all things, No Man’s Sky has been the one to remind me just significant I can ever hope to be. This might just be a game, but the aimlessness of it, coupled with the utter uncertainty that comes from its randomness, left me feeling really quite apprehensive, alone, and tense. That’s as far as I’ve got in the game so far. 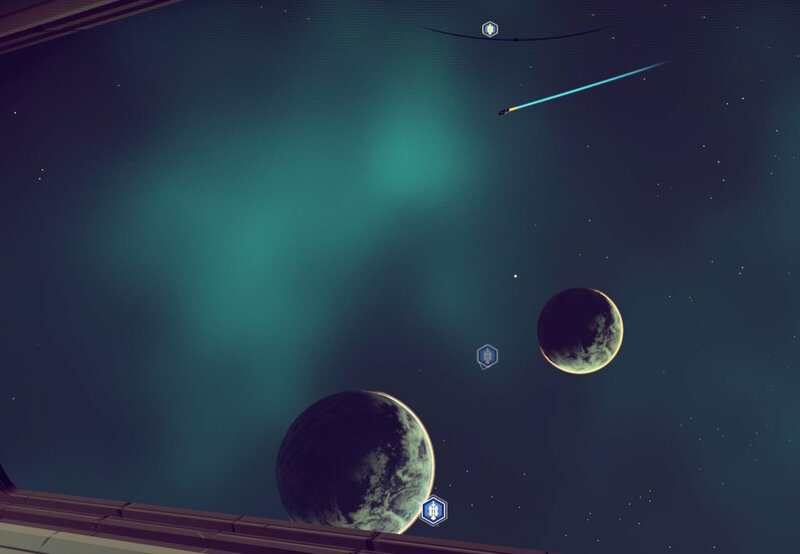 I’m sure I’ll get over that feeling, and start to piece some structure to the game (yes, I’m aware that there is an eventual goal in No Man’s Sky, but at the start the game does a horrible job of actually communicating that). This really is one beautiful, potent, and emotionally engaging game, and I’m looking forward to digging into it more deeply. Unless something drastic goes wrong, any criticisms that others are levelling at the game (and yes it has been slammed by many in those reader reviews that sites would be better off getting rid off) are completely unfounded. No Man’s Sky is special.